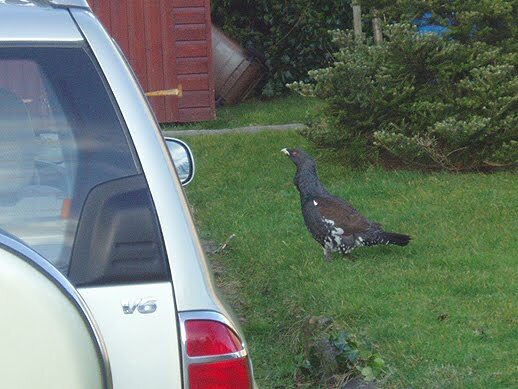 Thanks to John Urquhart for this picture of a Capercaillie, he thought Gurnites might appreciate a look at this rare creature, here it is first footing in Merryton on New Year's Day. It seems this bird has taken up residence on the eastern side of the River Nairn with sightings reported in Broadhill and the industrial estate too. Update: Billy sent the next picture in - nothing like a grouse when first footing. Will it eat breadcrumbs?lets hope for its own sake it doesn't. The capercaillie is clearly in need of a custodian, hmm... I wonder who that could be? Someone told me that in the wild Capercaillie mainly survive on a diet of chopped carrots and corn, does anyone know if this true?